Folkestone Club Site is a popular cliff-top campsite with birdwatchers, sea anglers and Channel hoppers. Our Folkestone Club Site is ideally located whether you’re holidaying in Kent or taking a day trip to France by Channel Tunnel. The campsite enjoys a dramatic cliff-top position with stunning views of the sea and the chalky cliffs of the Dover-Folkestone Heritage Coast. The campsite is surrounded by the trees and shrubbery of The Warren, a local nature reserve and a Site of Special Scientific Interest. Nature trails weave their way through The Warren, an important habitat for many rare plants and animals. Guided walks run from April through until September. This peaceful campsite is well laid out with a mix of grass and hardstand pitches. The excellent facilities include a parent and child room with a baby bath, shower, and a highchair with harness. Walkers and dog owners will enjoy the walks from the campsite along the cliffs and beach. 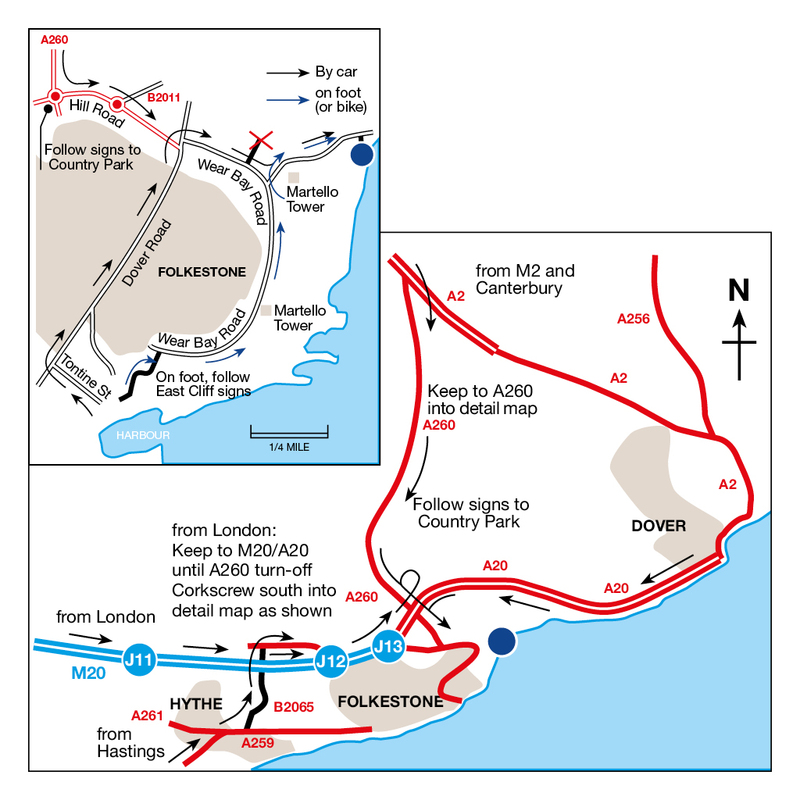 You can walk into Folkestone and Dover using the footpath from the site too. Folkestone has a cobbled High Street, harbour, promenade and a sandy beach next to the harbour. Dover, with its world-famous white cliffs, has an interesting castle. South of the campsite is the seaside resort of Hythe, while Romney Marsh boasts three of the finest family-friendly sandy beaches in Kent – Dymchurch, Greatstone, and St Mary’s Bay. The shingle beach at Dungeness is backed by an RSPB Nature Reserve visitor centre and the area is brimming with plant and wildlife. No Touring Caravans on site. This site is not suitable if you need to leave for an early ferry, as the site gate does not open until 7am, and there is no overnight parking. Limited parking for visitors or for second cars. Long narrow access road. There are several stalls selling fresh fish in Folkestone. Hythe has good greengrocer shops and fishmongers, all selling local produce. A farmers’ market is held at Capel-le-Ferne. Located on the famous white cliffs between Dover and Folkestone, this moving memorial honours Winston Churchill’s famous “few” who fought in the skies during World War Two. Arguably England’s most iconic fortress, Dover Castle has guarded the gateway to Great Britain for nine centuries. Climb the Great Tower, meet the costumed characters and uncover the history of the Secret Wartime Tunnels. Home to over 400 animals across 50 species, Howletts Wild Animal Park is a fun-filled day for the whole family. Get up close with some incredible animals, including African Elephants, Lowland Gorillas, Black Rhinos and Sumatran Tigers. Founded in 597AD, Canterbury Cathedral is the oldest and arguably most famous Christian structure in England. Since the Middle Ages, Christians have made the pilgrimage to this spectacular cathedral. Don’t forget to see the shrine of Thomas Beckett and the seat of the Archbishop. A great campsite to explore Canterbury, with a bus stop outside the site entrance.